It seemed time for a fresh batch of tee shirts. 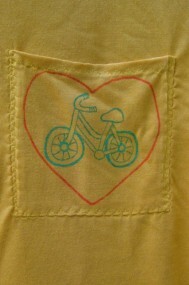 I’ve been playing with a lot of new designs and styles, expanding from just the bicycle-themed shirts. 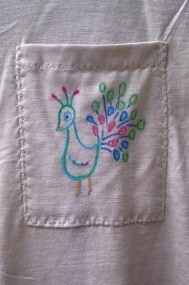 I like having the drawings on pockets–it gives me more flexibility than if I stuck to all-over drawings only. 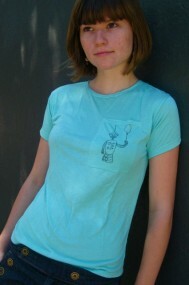 As always, these shirts are cut from my own pattern. The soft stretchy jersey fits just about any body beautifully! And, they are all available in my Etsy shop. 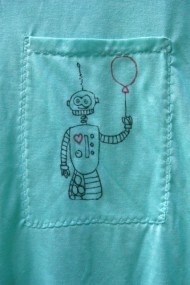 I call this one Robot Heart, named after a particularly rockin art car at Burning Man. The robots of the future will love and carry red balloons! I really love these peacocks! It’s such a great bird for stylization and color experiments. Jason even says they look slightly alien. 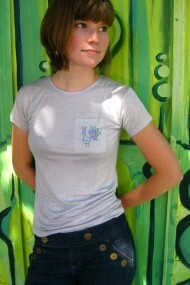 I made one peacock tee shirt and another scoop-neck tank. Well, I can’t stay away from bicycle shirts completely! This one really spells it out–bicycles are fun, no room for arguments. Many thanks to Lorraine for modeling these outside the Rendezvous bar in Seattle! You can also see this post on Craftster.